Show them all about you and your business. Get clients and companies excited about what you have to offer. Let them know how you can help them by using a top-notch 1 or 2-sided media kit. 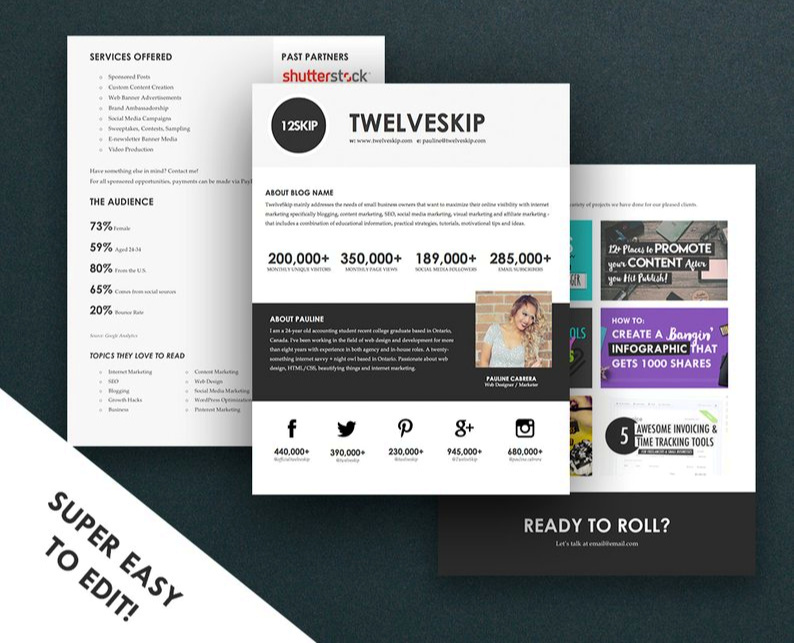 I personally use the Twelve Skip templates and I made my business media kit 2-sided. In the Twelve Skip media/business templates you can add your services + products / about you and your business / your social media stats / your website traffic stats/brands you’ve worked with / samples of your work/testimonials/logo and much more! Customize it for you! When I’m asked to provide my stats to a potential sponsor or when I’m contacted about a blogging influencer opportunity or just about my business, I’m confident in providing a sleek and professional Media Kit. Check them out, and if you need me to put together your TwelveSkip Media Kit, just let me know. Note – The link is not an affiliate link. Just sharing something that I love and use.